Fellowships and scholarships help support and enhance the graduate education experience in the UC Davis Department of Philosophy. A fund established in the memory of Aldo Antonelli supports graduate students working in logic and philosophy of logic. 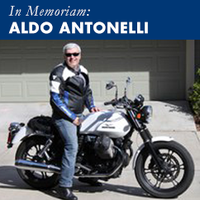 Aldo Antonelli was a UC Davis professor of philosophy who died at age 53 while bicycling with friends in October 2015. Antonelli was an expert in pure and applied logic. His research largely focused on issues in defeasible reasoning and non-monotonic logic. His more recent work in philosophy of logic was concerned with applications of generalized quantifier theory and abstraction principles to the foundations of arithmetic in the more general context of Fregean foundations, as well as making contributions to Frege scholarship. Together with his partner and colleague, philosopher of mathematics Elaine Landry, [link to her bio] Antonelli established philosophy of logic and mathematics as a focal point of scholarship in the Davis department. Antonelli was a member of the Association for Symbolic Logic, the American Philosophical Association, the Philosophy of Mathematics Association , and the Society for Exact Philosophy. He had served as coordinating editor of the Journal of Philosophical Logic and the Review of Symbolic Logic. He taught at Pittsburgh, Yale, Stanford and Michigan State, before joining the University of California, first at Irvine in 1998, and then moving to UC Davis in 2008. Learn how you can donate to the Aldo Antonelli Memorial Fund. Financial support for UC Davis graduate students is available in several forms, including External Fellowships, UC Davis Internal Fellowships, Academic Employment, Nonresident Supplemental Tuition (NRST) fellowship programs for nonresident foreign students, and loans. Learn more from the Office of Graduate Studies.